Roamin' Gnome Video Slot Review - Casino Answers! Roamin’ Gnome is a 5-reel, 30-line video slot developed by Crypptologic, featuring a wild symbol, expanding wilds, scatter wins, multipliers, a free spins feature, a bonus game. 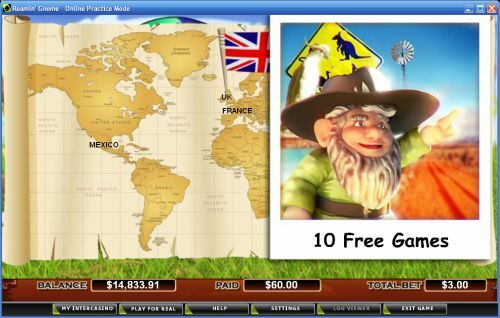 You can play the Roamin’ Gnome video slot at [Americans: Unfortunately due to legal restrictions you are unable to play at any of the online casinos this game is at. We recommend you trying playing the unique slots at Win A Day Casino instead.]. Roamin’ Gnome is a penny slot. Bets on the Roamin’ Gnome slot machine are $0.01, $0.02, $0.03, $0.04, $0.05, $0.10, $0.15, $0.20, $0.25, $0.50, $0.75 and every increment of $1 up to $20. You can select up to 30 paylines per spin. The maximum total bet on the Roamin’ Gnome slot game is $600 per spin. Roamin’ Gnome has a excellent betting range that will suit any online slots player – casual player or high roller. To play the Roamin’ Gnome online slot, select your bet and hit “Spin” or use “Bet Max” to play all 30 lines. The top-paying symbol on the Roamin’ Gnome video slot is the Gnome symbol. If you hit 5 Gnome symbols on a selected payline, you will win the 5000 coin top jackpot. The Gnome is wild and will substitute for all symbols except for the Scattered Plane symbol. 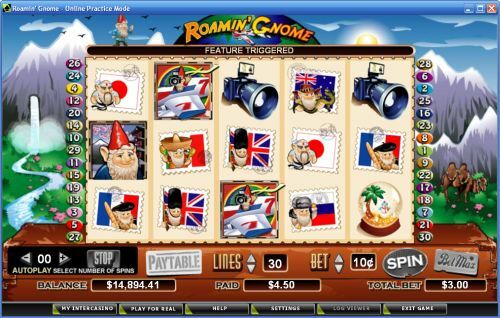 Other high paying symbols on the Roamin’ Gnome online slot include the Passport (2500 coins) and Suitcase (1500 coins) symbols. After every spin you make on Roamin’ Gnome, the gnome will hop ontop of one of the five reels. When the animated Roamin’ Gnome appears above a reel which has a Gnome wild symbol on it, you will activate the Roamin’ Gnome feature. All symbols on that reel will become wild. Payouts will then be calculated and awarded. Roamin’ Gnome feature prizes are multiplied by the bet per line. Use this feature to win big on the Roamin’ Gnome casino game at [Americans: Unfortunately due to legal restrictions you are unable to play at any of the online casinos this game is at. We recommend you trying playing the unique slots at Win A Day Casino instead.]! Payouts are displayed on the Paytable. Payline wins are multiplied by the bet per line. Highest win amount is paid on each selected payline. Scatter wins are multiplied by the total bet and added to payline wins. Feature wins are added to scatter and payline wins. Winning combinations pay from left to right only, except for the Scattered Plane. The Gnome will substitute for all symbols except Scattered Plane. Roamin’ Gnome has a basic autoplay mode. You can play from 1-99 autoplay spins on the Roamin’ Gnome video slot. Use the left and right arrows to select your number of autoplay spins. You can stop the Roamin’ Gnome autoplay mode at any time by pressing the “Stop” button. The Roamin’ Gnome video slot has excellent presentation put forth by Cryptologic as well as some very good special features and payouts. You can play Roamin’ Gnome by signing up and making a deposit today over at [Americans: Unfortunately due to legal restrictions you are unable to play at any of the online casinos this game is at. We recommend you trying playing the unique slots at Win A Day Casino instead.]. Can players from the USA play the Roamin’ Gnome video slot for real money? Unfortunately, American players cannot play this video slot for real money at Cryptologic online casinos. For a travel-themed video slot you can play, we recommend that you read our Spin The World CTXM Slot Review. Where can I play a flash game of the Roaming Gnome slot game? If you are looking for a flash game of the Roamin’ Gnome slot machine, head on over to [Americans: Unfortunately due to legal restrictions you are unable to play at any of the online casinos this game is at. We recommend you trying playing the unique slots at Win A Day Casino instead.] and play at their Instant Play casino. You can play the Roamin’ Gnome flash game for real money only. If you experience any problems with the flash casino, we suggest downloading the newest version of Adobe Flash Player.